You must have wondered about the history and meaning behind lockets. Lockets, even centuries back had the strong ability to speak about a woman’s personal story. It secured its place ages back as mourning jewelry which continually evolved to reach the zenith of fashion while Queen Victoria’s reigned. Often during that period, more sentimental pieces came to be lockets with a lock of hair inside. Again, interestingly, fashionable Romans were known for wearing pieces containing the lock of hair of one they deeply loved. Today, there are many celebrities such as Katy Perry, who carry a lock of hair in their personal lockets, representing a unique personal way to hold a special someone close to heart. Lockets, of course, evolved to have more than merely a lock of hair of a loved one. The outstanding idea of having portraits inside the lockets came into being after Charles I had been beheaded in the year 1649. Hayden Peters, the famous historian and art director hold that royalists and many others wore lockets with portraits of Charles I during that period. Regardless of one’s age, women have always been fond of lockets as they offer that much desired contemporary look, and speaks of timeless sensibility teamed with inherent intrigue, mystery and uniqueness. As soon as the wearer makes a locket her own, she highlights unrivaled exclusivity. Similar to a watch or a bracelet, to today’s women, lockets are the basic of new wardrobes. They can be ideal for everyday wear as they complement business or casual attire, to your relief, a wide range of uncommon styles allow lockets to perfectly accent the exotic designer wears. With the precious collection of lockets, today’s women may own lockets that are customization for different occasions. Unlike previously, now she can get a polished, classic, sleek or exquisite, a design that stands out and is inevitably breathtaking. So, make sure that your locket proves its worth. One of the very obvious ways to create special keepsake is by adding a special touch, merely a little something on the inside of a locket. You may experiment with anything and everything, as long as it holds a thoughtful nature. However, here are some ideas as to how you can personalize a locket. This happens to be the classiest ways of customizing lockets. Just think of adding the would be bride's to be initials to the front of a precious locket. This indeed is one of the best customized jewelry gifts for him/her. If she is a close friend of yours and just the initials seem boring, look forward to adding an image of the couple. If you are still not satisfied with this idea, put a dry petal from a wedding bouquet or a small piece of wedding dress material to the locket. A small locket can make a golden memory. Custom lockets with engraved icons, symbols or characters appear to be unusually attractive. Say for instance a semicolon may hold a very special meaning for you and your lover, so why not put one on your lover’s locket. Peace and cross symbols have always been a popular choice. You could experiment with a butterfly, wine glass, rose, cup and so on. 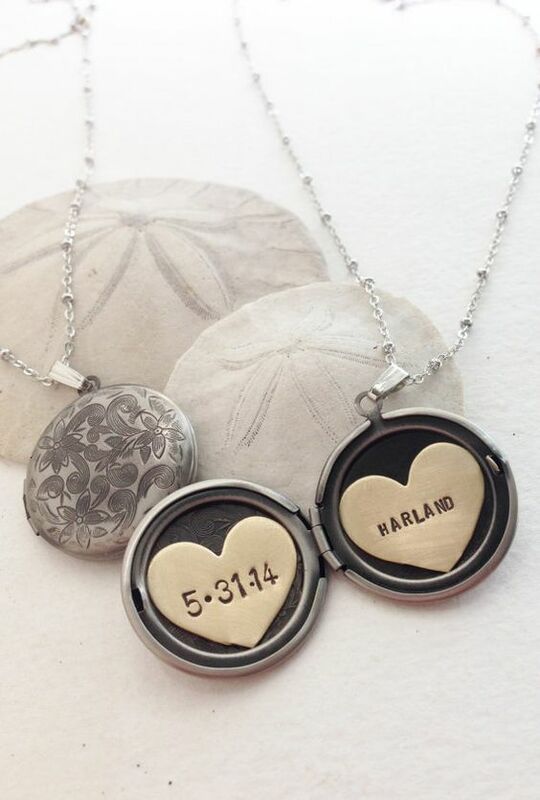 Since photos are in trend, why not add special images or a photo collage in a locket to customize it. How about inserting one of the oldest pictures of you, your father and your mother in a locket. This is surely going to be one of the most unique anniversary gifts for her. This is though not the case with every locket, but with most, the lockets are often designed in a way that you can engrave names, or date inside. Even if you have never experimented with a locket before, you can seek help from an online or offline store specialist and they’ll surely tell you if you can engrave. A personalized name or date engraved on the locket is bound to make its impression on the recipient.